It is no secret that Japan loves to drink and of course Osaka, known for its friendly people and fried street food, has some of the best nightlife in Japan. There is a whole world of variety outside of the chain bars and izakayas in Osaka, ranging from small live houses to tiny eateries housed in former offices. Get ready to party all night in Japan’s expressive and most rambunctious city. Let’s begin by introducing a number of popular nightlife areas in Osaka where you can spend an evening bar hopping. Ura-Namba refers to the “backside” of Osaka’s bustling Namba district and is packed with cheap eateries and drinking establishments. Stretching between Namba Grand Kagetsu and Sakaisuji, you can spend a night hopping between tiny bars and izakayas that dish up a wide range of global cuisine. Be sure to visit the 1970s Misono Building where you’ll find dozens of tiny bars and a lively atmosphere. Tucked in behind Tenma Station, this is another vibrant nightlife hub where you can find dozens of bars and restaurants. It centers around the Instagrammable Chochin-dori, an arcade that’s magically illuminated by around 700 lanterns. 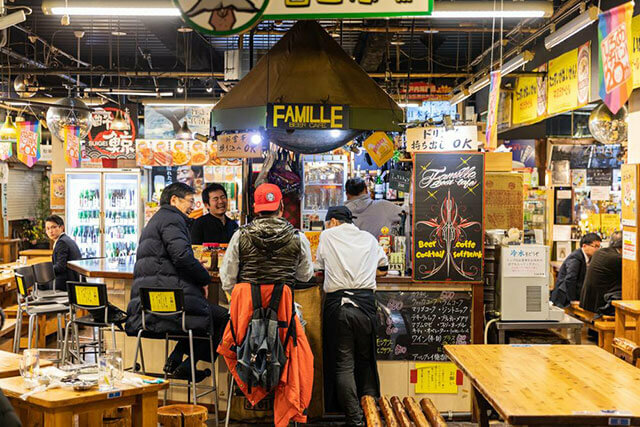 Whether you want to feast on spare ribs washed down with beer or sip sake with small bites, there’s something to suit all tastes along this iconic street. Just a 10-minute walk from the Umeda Sky Building you’ll arrive in Fukushima, a laid-back area of bars and eateries that is popular with white collar workers. It’s a great place to get a first-hand look at how local residents like to party, with plenty of places where you can settle in with a drink and just mingle with the workers. Boasting some of the finest clubs in Osaka, Kitashinch lies just to the north of Osaka Station and exudes a sophisticated nightlife atmosphere. 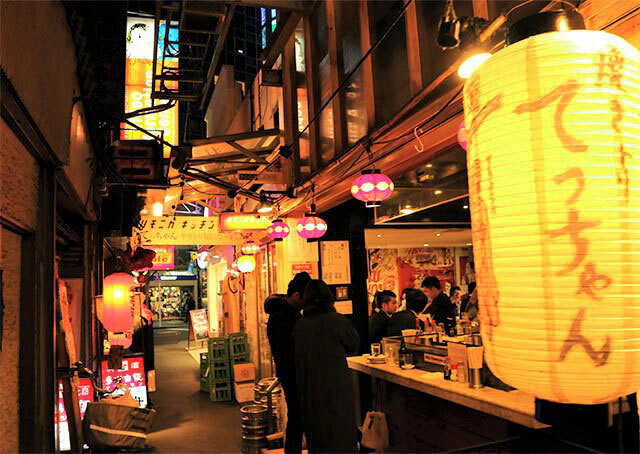 It features narrow streets that are brightly illuminated by flashing neon signs and are filled with high-class bars, clubs and tiny restaurants serving sake and sashimi. It was once a popular geisha area and is now frequented by Japanese businessmen entertaining their international clients. With the “Eiffel Tower of Osaka” towering above, this area has a more working class feel. It’s packed with 24-hour shops and cheap eateries where you can feast on kushikatsu (skewered meats), as well as plenty of bars serving affordable drinks. It’s named after the Tsutenkaku tower, which was once the tallest structure in the Orient and was rebuilt following World War II. If you want a taste of Korea in the heart of Osaka, head to Tsuruhashi or “Korea Town”, which is the largest of its kind in Japan. Its main street is lined with shops selling everything from kimchi to instant noodles, as well as plenty of Korean BBQ restaurants where you can try yakiniku (grilled meat). Many Koreans migrated to the area during the early 20th century and the traditional atmosphere is still apparent today. 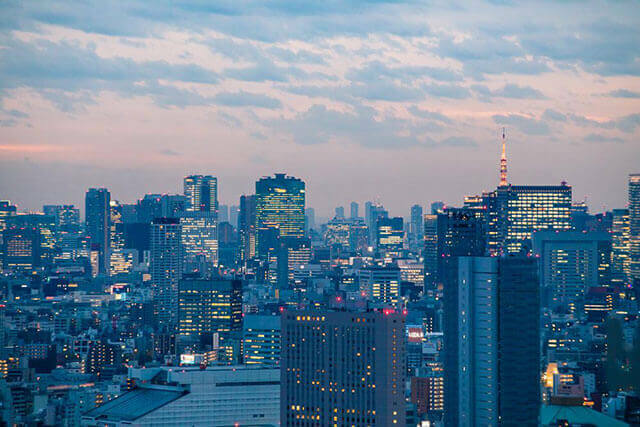 To help you plan your night out in Osaka, here are some of our top recommended establishments. 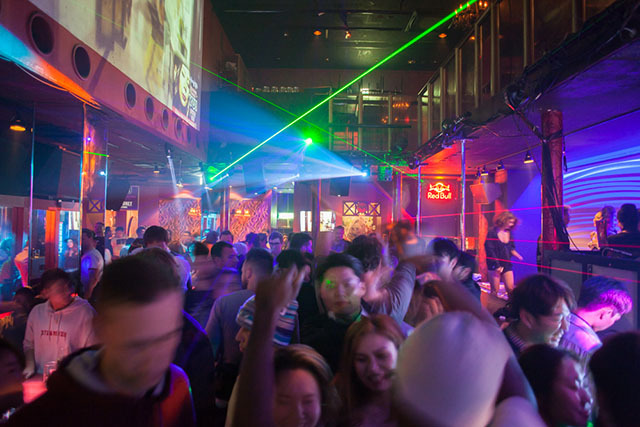 For large dance clubs Shinsaibashi has some of the liveliest venues in Osaka. Sam and Dave is the place for late night parties after the last train. The crowd gets sizeable around 1AM which makes it the perfect place to hit up towards the end of the night. The club is popular with the young and international camp and can feel more like a major city outside of Japan. Events are held often and give reasons to drink and dance with purpose. For a more hidden venue, the Misono building houses a Golden Gai style group of bars on its second floor. The building once housed businesses but has been refurbished into a variety of bars and eateries. Each bar is tiny and intimate with a small occupancy. 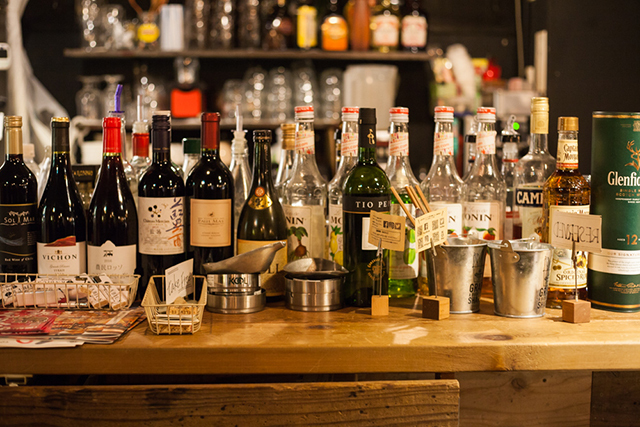 The Misono building makes it easy to bar hop and try all the different drinks. Royal Crown is a foreigner friendly cocktail bar where the cordial English speaking owner is interested in meeting new people. Not only is the conversation fun but Royal Crown makes some of the best original cocktails in Osaka. The bars and restaurants all vary with their closing times but most are open from 7PM. Situated in the American village, this store specializes in all things fruit. It’s the place to head for delicious cocktails, with plenty of fresh fruit used in their creation. Movies are aired in the store to create a relaxing atmosphere and you can even grab a fruit sandwich filled with fresh strawberries, oranges and cream if you want a bite to eat. For a tame night out catch a live performance at Noon + Cafe in Nakazakicho. Located underneath the JR Kyoto line train tracks, Noon + Cafe is a cozy daytime cafe that turns into a club and event space in the evening. There are live shows or local DJs almost every night with a wide line up, from foreign bands to techno DJs. The ambiance for concerts can be relaxed while DJ nights bring in partiers from all over the city. The venue is intimate with industrial style decorations and eccentric artwork on the walls. Dinner is also served so be sure to get there before the party starts. The cafe specializes in American style food and is best known for their hamburgers. Noon + Cafe is open from 11AM to 11PM everyday. Kyobashi acts as central Osaka with its numerous bars and restaurants operating late into the night. One of the liveliest bars is Bar Pacha with its energetic atmosphere and good music. Locals do not come to Bar Pacha for its drinks but for its clientele. Some of the friendliest people in Osaka frequent this bar and tend to strike up conversations with newcomers. Calling itself an “American style bar”, Bar Pacha offers classic American comfort food alongside their drinks. The bar is small and people end up standing but it’s perfect for making a new friend in line. Bar Pacha is open from 5PM to 3AM on weekdays and until 4AM on weekends. Traveling solo? To meet new people, both locals and tourists, try a pub crawl hosted by the website Meet Up. Tour guides scout out the best bars and pubs, such as Blarney Stone Pub, in popular nightlife areas like Shinsaibashi. The cover charge covers shots at the bars and discounts on various drinks throughout the night. Since the crawl is led by guides, all visitors need to do is show up and drink. For a larger venue, Balabushka is a standard American style sports bar with pool tables, dart boards and foosball. Drinks are standard and the food features American dive bar favorites such as french fries and nachos. There is a large TV that plays the most popular sports games and the bar can get crowded during big events.